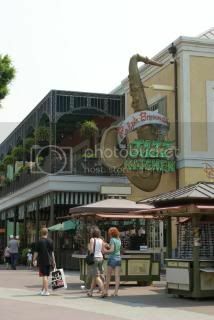 For our first day at Disneyland I had made Priority Seating arrangements for Ralph Brennan’s Jazz Kitchen because they had a Sunday brunch with a Zydeco band. When I waited tables at Copeland’s one of my favorite times to work was Sunday brunch. Not only because of the wonderful menu but because of the music. I thought this would be a great way to kick off our trip. We arrived just a couple minutes before our 11:20 am PS reservation. We decided to be seated inside since it was hot and there was to be music. We were seated by a stage which had nothing but a crazy outlandishly decorated piano. We looked at the menu and noticed no brunch items just lunch. When are server greeted us we inquired about the music and brunch. He explained that they had discontinued the Sunday Zydeco brunch. I was disappointed for it was the main reason I decided to eat at this time. After looking at the menu I decided to order Red Beans & Rice, Camellia red beans, andouille sausage, Tasso ham, Creole seasoning served over popcorn rice ($10) and my husband ordered the Muffuletta Po-Boy, ham, Genoa salami, provolone cheese, olive salad served with homemade potato chips ($11). 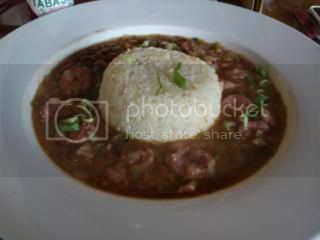 The red beans and rice were delicious. It was very flavorful, with a nice amount of spice. It barely needed any Tabasco. It was filled with sausage and tasso which I was very pleased with. I love tasso! 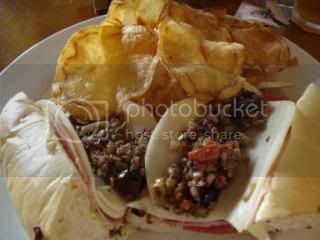 The Muffuletta was also very good. It was stacked with meat and cheese and the olive salad on it was just the right amount. Not too much as to overpower the flavors of the meat and cheese. 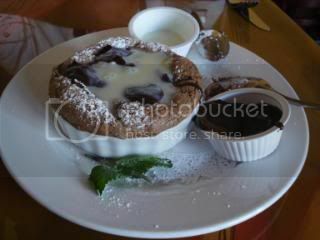 When we ordered our entrees we were told about their famous Double Chocolate Bread Pudding Soufflé ($10) which had to be pre-order because it would take 30 minutes to make. We decided to give it a try. I’m glad we did. The bread pudding is served with a side of white and dark chocolate ganache. Once presented to the table he poked holes in it to let out the steam, then he poured both the white and dark chocolate ganache over the top. WOW! Was this good. It wasn’t too chocolaty and the white chocolate and a nice lightness to the dish. If you ever dine at Ralph Brennan’s I highly recommend ordering this. This restaurant gets a 3 out of 5 Mickeys.